I have recalibrated an accurate Al-in hornblende barometer from experimental litterature data on rhyolites (Médard and Le Pennec, submitted). This new barometer takes into account the effect of both edenite and Tschermack substitutions on Al concentrations. Existing litterature data show a very good pressure-dependence of the Tschermack substitution (correlation coefficient of 0.95) for amphibole in equilibrium with biotite, plagioclase and quartz. Our new barometer reproduces experimental pressures with an average error of 58 MPa (equivalent to a depth of 2.2 km) in the 100-400 MPa range. More experiments are underway to improve the barometer’s accuracy. Compared to previous barometers, this new calibration is independent of temperature, and gives a much better resolution for magma chamber depth. The Cappadocia area of Central Turkey superbly exposes a succession of Neogene dacitic to rhyolitic ignimbrites and fallout deposits, recording 10 Ma of magmatic activity. This provides an excellent example of long-lived, relatively low frequency magmatic system, with a low average magma production rate (about 10-3 km3/a), but short-lived large eruptions (up to 300 km3 for the Cemilköy ignimbrite). Most of the ignimbritic and fallout units share a very similar, low-variance, phenocryst mineralogy (plagioclase + biotite + amphibole + magnetite + quartz), which makes them perfect targets for Al-in amphibole barometry. Pre-eruptive temperatures are relatively stable for most units, between 700 and 760 °C. Amphiboles crystallized in the upper crust, between 9 and 14 km depth, hinting at a constant depth of magma storage beneath the Cappadocian ignimbrite field. Detailed investigation of one of the youngest unit, the Kizilkaya ignimbrite, produces a tight unimodal pressure distribution at 260 ± 18 MPa (9.8 ± 2.2 km depth), with a maximum data dispersion lower than the 2σ uncertainty of the barometer. We show that this distribution is caused by the analytical uncertainties of the electron microprobe. The pressure distribution can be fitted by a combination of a Gaussian distribution (microprobe uncertainty) and a step-like distribution of pressure related to the thickness of the magma chamber. Assuming the erupted reservoir was homogeneous, as suggested by the absence of magma mixing, and amphibole was present in the entire reservoir, we can calculate the thickness of the magma chamber (1.1 ± 0.4 km) from the fitting results. With a knowledge of the erupted volume, we can then infer the diameter of the magma chamber and its aspect ratio. In agreement with theoretical studies, the aspect ratio of the magma chamber would be relatively low, between 0.07 and 0.20. Based on the approach above, our new temperature-independent barometer is a promising tool for imaging silicic magma chambers, since the eruptive products of most silicic super-eruptions contain amphibole crystals. Statistical analysis of large amphibole populations is much more accurate than random analyses of a limited number of crystals. Combination of petrological and volcanological data provides refined constraints on the shape of large silicic magma reservoirs and can serve as a guide for geophysical monitoring of future eruptions, particularly in areas where geophysical signals suggest the Earth is getting ready for a new super-eruption and pre-climactic amphibole-bearing products are emitted. 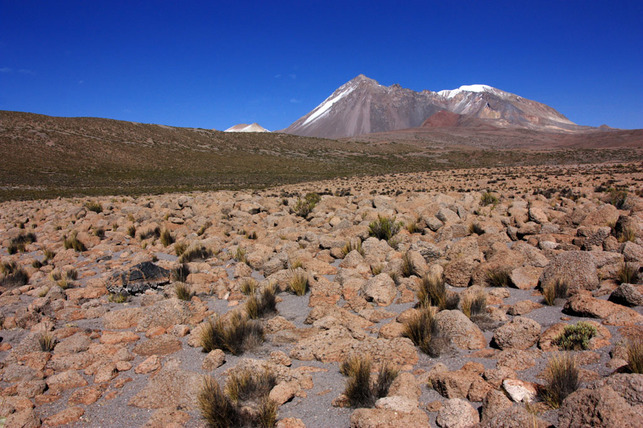 For example, the Laguna del Maule volcanic field has recently shown an episode of unrest that could be related to the build-up towards a future super-eruption. Products of recent minor eruptions associated with this system contain amphibole crystals whose analyses suggest these small eruptions tapped magmatic reservoirs located at average depths of 4-5 km, consistent with geophysical estimates of the depth of the main magma reservoir (about 5 km). Detailed investigation of such pre-climactic eruptive products may better portray the shape and depth of the current magma chamber beneath Laguna del Maule and guide geophysical monitoring of a future large silicic eruption. Other studies are underway on the magma chamber processes that led to the ~1800 AD eruption of the Tutupaca volcano, in Peru (Manrique et al., in press), on the Long-Valley/Mono-Inyo magmatic system in California and on the latest magmatic evolution of the Sancy stratovolcano (260 ka, French Massif Central). We have been performing detailed thermometric studies on basaltic lava channels at Kilauea (Hawaii) and Piton de la Fournaise (Reunion Island, Indian Ocean). With careful sampling and sample preparation, the olivine/liquid thermometer of Ford (1983) gives enough precision to be able to calculate cooling rates in lava channels. Values of about 7 °C/km have been determined for the Muliwai a Pele lava channel emplaced during the final stage of Mauna Ulu’s 1969–1974 eruption. These values are then integrated into multiparameters models of lava flows that can be then used for prediction of lava flow paths. I am also using similar techniques to help monitor the evolution of the ongoing explosive basaltic eruption on Ambae Island, Vanuatu. Rhéty M, Harris AJ, Villeneuve N, Gurioli L, Médard E, Chevrel O, Bachélery P (2017) A comparison of cooling- and volume-limited flow systems: examples from channels in the Piton de la Fournaise April 2007 lava flow field. Geochemistry, Geophysics, Geosystems 18: 3270-3291, doi: 10.1002/2017GC006839. Latutrie B, Harris AJ, Médard E, Gurioli L (2017) Eruption and emplacement dynamics of a thick trachytic lava flow of the Sancy volcano (France). Bulletin of Volcanology 79: 4, doi: 10.1007/s00445-016-1084-6. Druitt TH, Mercier M, Florentin L, Deloule E, Cluzel N, Flaherty T, Médard E, Cadoux A (2016) Magma storage and extraction associated with plinian and interplinian activity at Santorini caldera (Greece). Journal of Petrology 57(3): 461-494, ﻿doi: 10.1093/petrology/egw015﻿. Sehlke A, Whittington A, Robert B, Harris AJ, Gurioli L, Médard E (2014) Pahoehoe to `a`a transition of Hawaiian lavas: an experimental study. Bulletin of Volcanology 76: 876, doi: 10.1007/s00445-014-0876-9. Robert B, Harris AJ, Gurioli L, Médard E, Sehlke A, Whittington A (2014) Textural and rheological evolution of basalt flowing down a lava channel. Bulletin of Volcanology 76: 824, doi: 10.1007/s00445-014-0824-8. Hetényi G, Taisne B, Garel F, Médard E, Bosshard S, Mattsson HB (2012) Scales of columnar jointing in igneous rocks: field measurements and controlling factors. Bulletin of Volcanology 74: 457-482, doi: 10.1007/s00445-011-0534-4. Malfait WJ, Sanchez-Valle C, Ardia P, Médard E, Lerch P (2011) Compositional dependent compressibility of dissolved water in silicate glasses. American Mineralogist 96: 1402-1409, doi: 10.2138/am.2011.3718. Médard E, Le Pennec JL (2018) Petrologic imaging of the magma reservoirs that feed super-eruptions. Manrique N, Samaniego P, Médard E, Schiavi F, Mariño J, Liorzou C (2018) Pre-eruptive magmatic processes associated with the historical (218±14 aBP) explosive eruption of Tutupaca volcano (Southern Peru).